Is your little man crazy for dinosaurs? What little nipper isn’t? 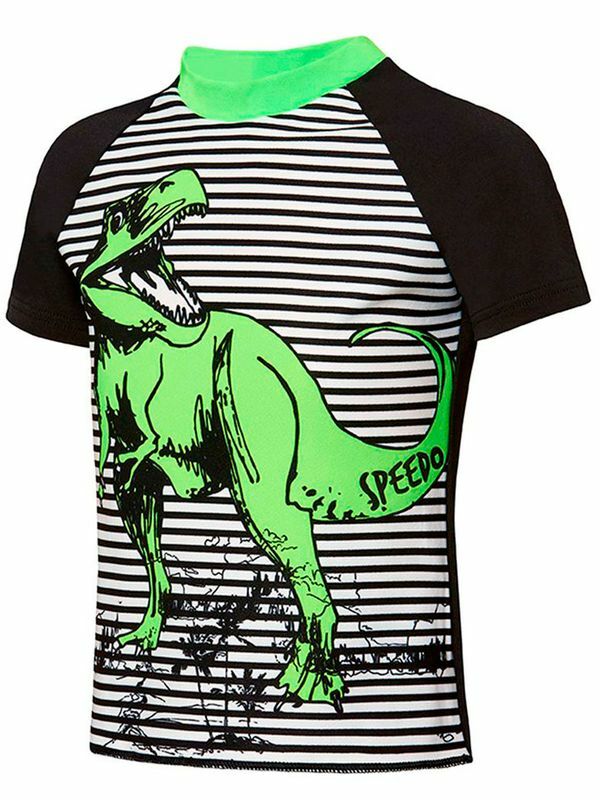 Show some prehistoric love in the adorable Speedo Dinotopia Toddler Boys’ Short Sleeve Suntop! This jet black sun top features bold white stripes underneath a fierce green dinosaur and a trendy lime green accent collar. Made with top grade chlorine resistant Endurance+ fabric, the Speedo Dinotopia Toddler Boys’ Short Sleeve Suntop has everything that beach obsessed little guys need. Resistant to sagging and bagging, this impressive sun top has been built to last a whopping 20 times longer than standard swimsuit fabrics so that it will stay looking flawless through countless days out at the beach. Dinotopia Toddler Boys Sun Top manufactured by Speedo Swimwear the worlds leading swimwear brand. Speedo is passionate about life in and around the water, creating revolutionary new technologies, designs and innovations.